I finally have a new computer! After weeks of frustrations we finally bought a new one. While I was away, I worked on recipes to share, made curtains (not yet hung) for J's room, started the Soccer mom season, and watched a whole heck of a lot of Blue's Clues (Bug's current favorite). Enough about what I've been doing and on to recipes. I vow to only share recipes that I have actually tried and in most cases tweaked a bit. I typically won't share a recipe until its deposited into the tried and true recipe folder. This way, I know and you know its a good one! 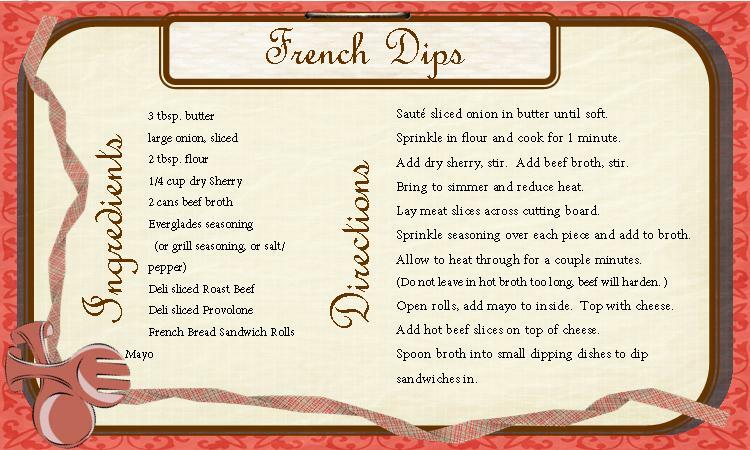 French Dips are requested by my family most often. 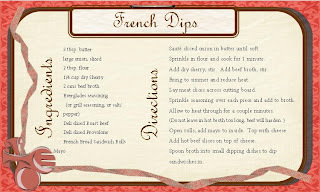 Everyone loves to dip them and I have no problems making them because it is so easy. Here's a printable recipe card. Sauté sliced onion in butter until soft. Sprinkle in flour and cook for 1 minute. Add dry sherry, stir. Add beef broth, stir. Bring to simmer and reduce heat. Lay meat slices across cutting board. Sprinkle seasoning over each piece and add to broth. Open rolls, add mayo to both insides. Top with cheese. Add hot beef slices on top of cheese. Spoon broth into small dishes for dipping your sandwich in! I do sew, I just practice avoidance of sewing.